The second day gets off to a much more leisurely start than the first. With my press pass already in hand, I’m able to skip all the registration lines and wander into the convention center the minute it opens. This seems like a great idea until I realize that I’m in almost an hour before anything starts. Secure on a bench in the Hynes second floor hallway, I collect my thoughts and people-watch. One thing is obvious: Attack on Titan owns this convention. Nevermind that the dub premiere is set to be today’s biggest event; it’s obvious by looking around that the show is the darling of the cosplay scene. For every Sword Art Online or Naruto cosplayer, there are at least two people in Survey Corps uniforms or Colossal Titan masks. One clever individual even combines the two, draping the iconic green hood over his titan-print tights. Boston traffic would’ve been easier to deal with if I’d had a set of maneuver gear. My thoughts are echoed at the morning panel for review website The Fandom Post. Veteran anime journalist Chris Beveridge suggests that Titan may be having an effect on the US anime scene on par with iconic shows like Cowboy Bebop. The original manga is the main focus of the Kodansha Comics industry panel later in the day, as the publisher launches an oversized omnibus collection and several spin-offs. Whether it’s the epic scale of the series, an unconscious connection with today’s fans, or the cosplay-ready military uniforms, some magic combination of factors has made Attack on Titan king of the hill over here. As I sit through a screening of Beck: Mongolian Chop Squad, the questionable English chorus of the theme song sums things up nicely. To repurpose the quote, Attack on Titan was made to hit in America. The rest of the day rushes by in an exhausting blur of industry panels and dealer floor buying sprees. 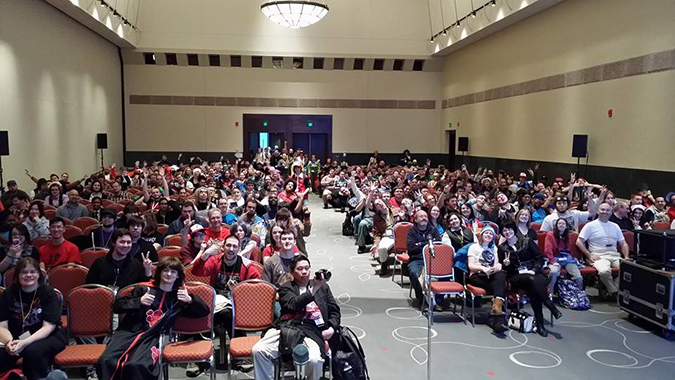 My brain short-circuits a bit during a panel explaining Kantai Collection, the latest online gaming craze in Japan. Something about fighting aliens with anthropomorphized battleship girls is simultaneously baffling and completely logical. I guess I didn’t realize the world had already moved on from airplane girls. I’m hoping they go for classic sports cars next. 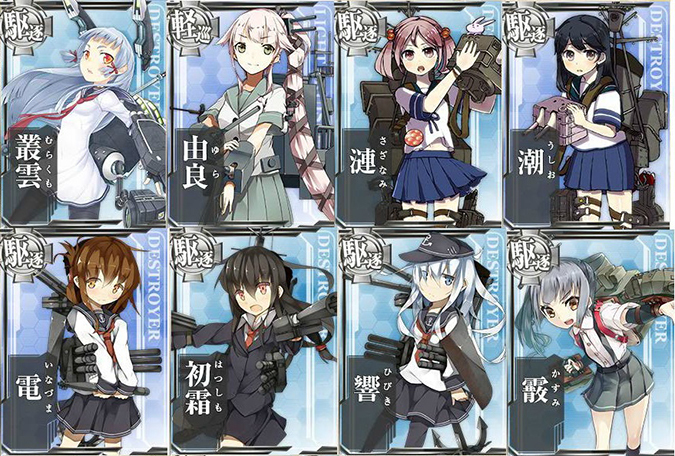 How many ship girls could a shipper ship if a shipper could ship ship girls? At the Kodansha Comics panel, I learn a couple of interesting things. 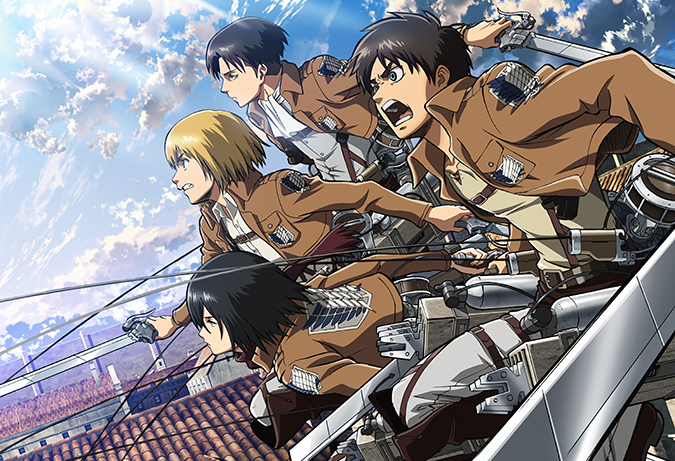 First, the Attack on Titan manga, which has seemingly owned the bestseller lists for an eternity, wasn’t a particularly big hit until the anime series came out. Second, there seems to be a push towards premium collector’s editions throughout the US anime and manga markets. The hardcover release of Vinland Saga reminds me of the big-ticket Blu-ray collections that Funimation is beginning to experiment with. I wonder if one of my past articles was right, and we’re starting to see “standard edition” physical media replaced by a combination of cheap digital content and expensive premium items. The Funimation industry panel is most impressive for the way it takes a huge room and packs it to the back rows with people. After running through some repeat information from yesterday’s events, we get to the big news items. There’s the Toonami airing of Black Lagoon, a dub release date for action comedy Ben-to, home video rights for A Certain Scientific Railgun S, and the dub cast announcement for Red Data Girl. Most importantly, we learn that a second season of Space Dandy will launch in July. Hooray for trippy sci-fi comedy, baby! I wander out of the Funimation panel to find the convention more crowded than ever before, and find myself more exhausted than ever before. I decide to forego the completely mobbed Attack on Titan dub screening and get a row of seats to myself at the Crunchyroll panel. A few catalog title announcements later, I’ve completed my final event of the day. I’m a bit disappointed to find that the convention is around a week too soon for spring simulcast announcements. A final trip through the artists and dealers nets a Kill la Kill poster, the Blu-ray release of Wolf Children, and a card game featuring anime maids. Yes, there’ll be a full article on that last one in the near future, and yes, it’s hilariously entertaining. Check out part one of our coverage here. Kawaii Overthink is written by Paul Jensen. You can follow his ramblings about anime on Twitter.